This is Scylla, a kitten from last year. In a boot. She’s a boy kitty. When you live on a farm, kittens happen. Once when I had a small number of cats, all neutered, someone dropped off a mother cat and her kitten at the end of my driveway. Mother and son broke some commandments and next thing you know, kittens. Last night my cat Consubstantial 2 had four kittens. I am relieved it was only 4. She’s been walking around looking like a basketball with legs. Consubstantial 1 and Umberto have also had kittens. If you are wondering why anyone would name a cat Consubstantial, you are probably not Catholic. (The fact that there are 2 named Consubstantial is because they look nearly identical and I can only tell them apart because Connie 2 hisses at me and Connie 1 (usually) doesn’t.) 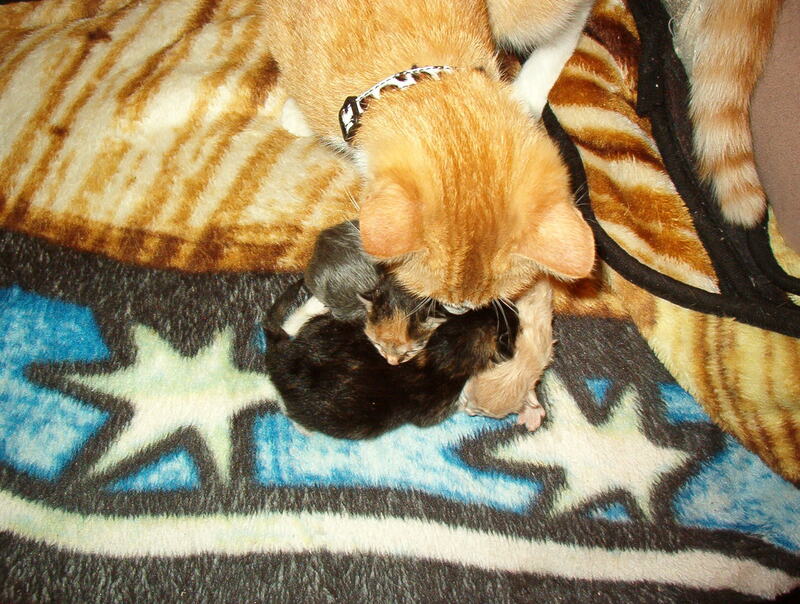 Here are Connie 2’s kittens. The adult cat in the picture is Julianne, who had to have an emergency caesarean earlier this year. Her kittens didn’t survive and she’s looking for replacements. This is the story of Kitten in Boot. I have some old winter boots that I use for chores. During winter they are usually on the living room floor somewhere. One day I noticed one of my kittens was missing. 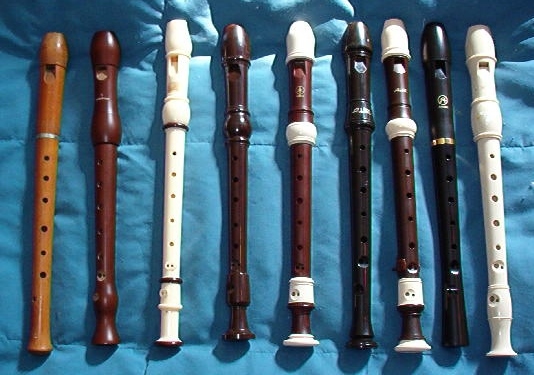 I looked and called for them but the missing one didn’t show up. Finally I looked in my boot a little more closely. The missing kitten had climbed in the boot, fallen asleep, and sunk deep into the boot. 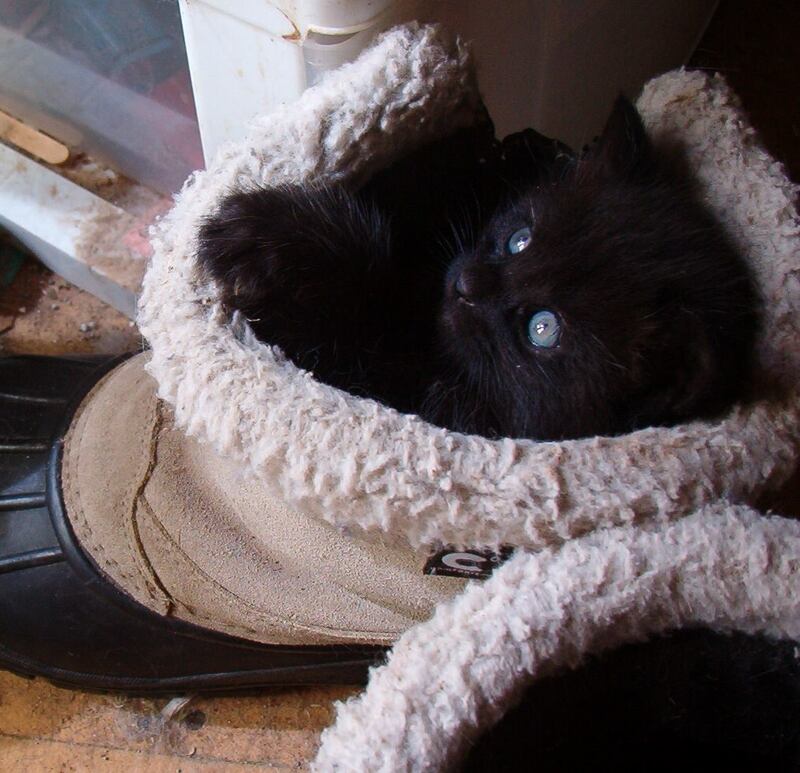 I took a picture of that Kitten in Boot, and have since taken pics of other kittens in boots. My sweet baby kitten Little Stranger was photographed in one of my cowboy boots. He has since grow up to be a vicious tomcat who is wanted for questioning in the mysterious death of a rival tom, Claude. But he still wants a little cuddle from Mama every now and again. The kitten in the boot pictured above was Scylla. I could have sworn he was a girl when I named him. Like the original Kitten in Boot, he fell asleep in the boot and couldn’t be found. Sadly, he went missing after he began life as a barn cat. I suspect Little Stranger drove him off. Comments are usually welcome here, but if some big-city animal rightser comes by to say it’s cruel for a poor, rural autistic woman like me to have cats, or kittens, or a home to keep them in, I’m going to treat that comment like the ones that suggest I go to Oregon for a permanent, assisted “suicide” cure for my autism spectrum disorder, and mark it as spam.